Thousands of flamingoes dot Big Momella Lake in Arusha National Park. 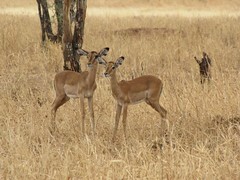 Photo taken on a 2013 Ujuzi safari. The closest national park to Arusha, northern Tanzania’s safari capital, Arusha National Park is a multi-faceted jewel, offering the opportunity to explore a diversity of habitats within a few hours through game drives, hikes and canoeing. The entrance gate leads into shadowy montane forest inhabited by inquisitive blue monkeys and colorful turaco and trogons. It is the only place on the northern safari circuit where the acrobatic black and white colobus monkeys are easily seen. 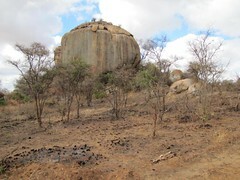 In the midst of the forest stands the spectacular Ngurdoto Crater, whose steep, rocky cliffs enclose a wide, marshy floor dotted with herds of buffalo and warthog. Enjoy this music video of highlights from my recent trip to Tanzania! It was tough narrowing hours of video down to just a couple of minutes, but somehow we managed to get dozens of animals and five national parks in there. I think my favorite capture is the cheetah stalking and chasing its prey in the Serengeti. What’s your favorite footage? Travel to Tanzania in 4-Star Style! I recently took a whirlwind tour of Tanzania, visiting five national parks and Zanzibar to find the best accommodations for safari travelers. At each place, I visited an average of half a dozen lodges and camps. All in all, I inspected 39 properties in 9 days. It was a lot of work, but it’s important to me that I see the properties I’m recommending to my clients in person. It’s rare in the travel business for agents to visit each country and property they work with, and that’s the difference I strive to offer: firsthand expertise that allows me to create unforgettable safaris that truly match each client’s needs. Day 1: Arrive in Tanzania. Overnight at Arumeru River Lodge. 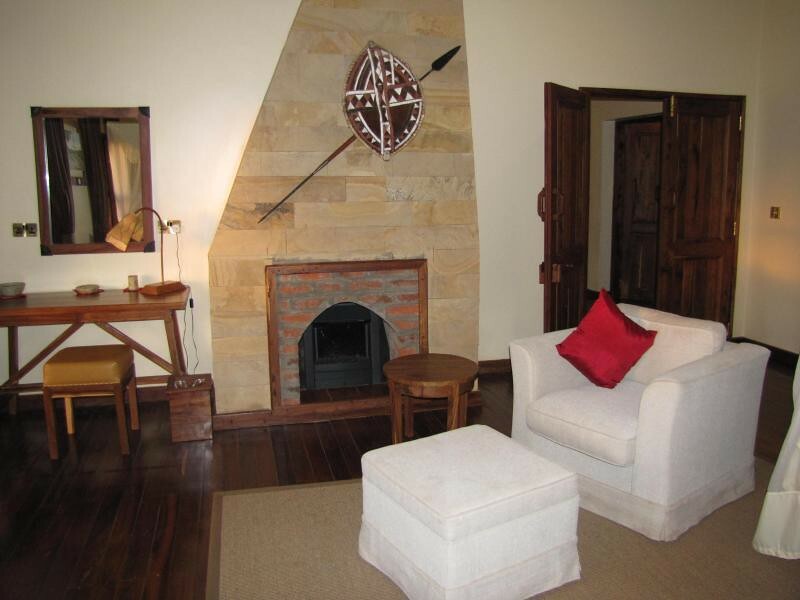 Arumeru River Lodge is on 12 acres of an old coffee plantation near Arusha National Park. The property has 23 standard rooms and 6 junior suites in cottages that border an exquisitely kept garden populated by a resident family of dik-diks. Family rooms and triples are available. Arumeru River Lodge offers half-day guided hikes in the nearby rainforest for a nominal fee and free guided garden walks through its grounds. Day 2/3: Tarangire National Park. 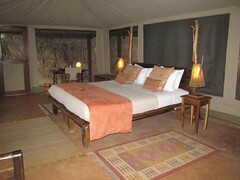 Overnight at Tarangire River Camp. Tarangire River Camp, a 21-tent camp that includes four roomy family tents and a spacious swimming pool for refreshing dips after a long day of safari. The camp overlooks the winding Tarangire River, which attracts a variety of animals even in the dry season when little water is visible. Electricity is available 24 hours. Day 4: Lake Manyara National Park. Overnight at Ngorongoro Exploreans Lodge. 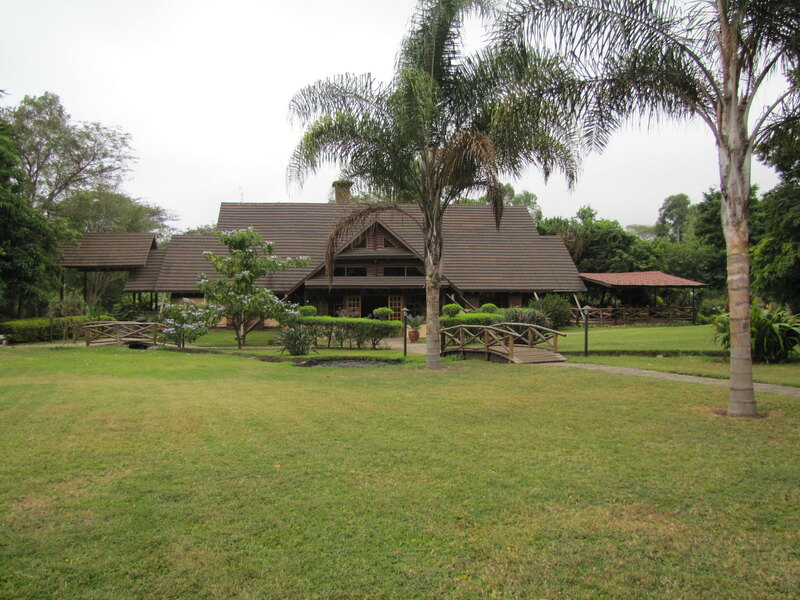 Exploreans Lodge is a 20-cabin luxury resort close to Ngorongoro Crater. The grounds are astounding, with vast well-kept vegetable, flower and herb gardens. Cabins have a living room, bedroom, en suite bathroom, and a balcony that overlooks a wildlife reserve and coffee plantation, with the Ngorongoro mountains off in the distance. On-site amenities include massage and spa services, a swimming pool, sauna and whirlpool spa. Exploreans is known for its small touches that make a stay truly great, such as a pillow menu that allows guests to choose from several different options to ensure a good night’s sleep. Day 5: Ngorongoro Crater. Overnight at Ngorongoro Exploreans Lodge. Day 6/7/8: Ngorongoro Conservation Area & Serengeti National Park. Overnight at Lake Masek Tented Camp. Masek Luxury Tented Camp has 20 well-appointed tents with en suite bathrooms that include a large tub, enclosed outdoor shower, two vanity sinks and a hair dryer. 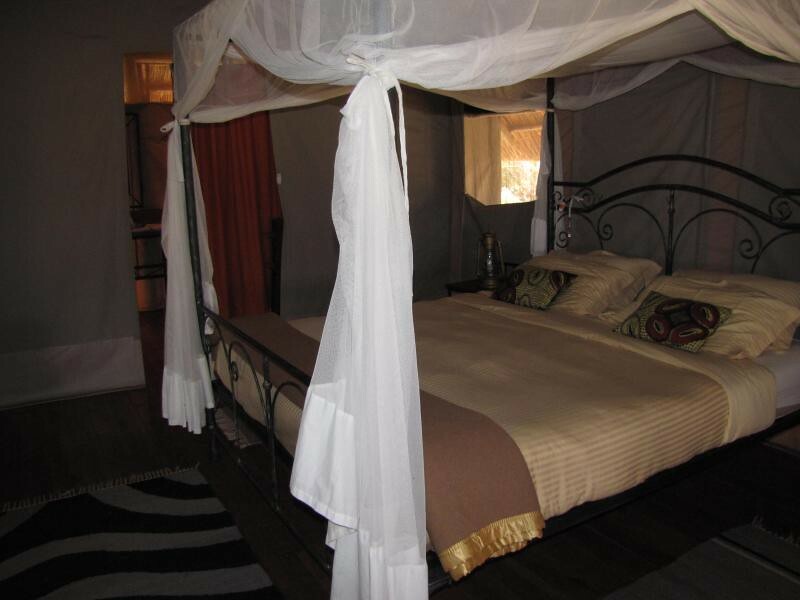 Each tent has a furnished veranda that overlooks Lake Masek, where hippos and Big 5 game abound all year. Electricity and hot water are available 24 hours a day. Day 9: Fly back to Arusha and depart for home or extension to Zanzibar. Keep an eye out for next week’s posting on 5-star accommodations! It’s our second full day in Tanzania. We awoke this morning at the Kibo Palace Hotel to a huge breakfast buffet featuring European, Indian, American and Tanzanian foods. If you ever stay here, be sure to try the African yam and fried cassava root. They were delicious bite of local flavor. 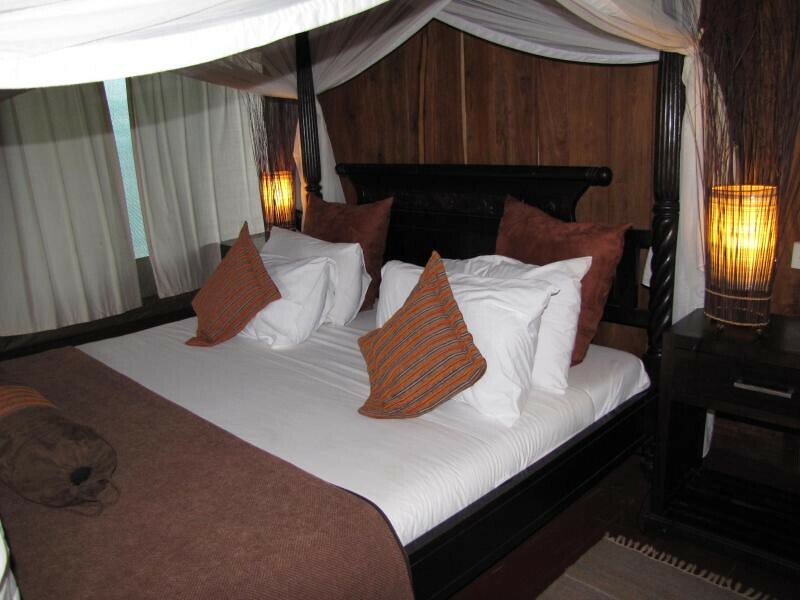 The Kibo Palace Hotel is a 77-room luxury hotel near downtown Arusha. Guests may enjoy complimentary Wi-Fi, a health club, swimming pool, and steam and sauna rooms. Named after Mount Kilimanjaro’s highest peak, the Kibo Palace Hotel strives to deliver the highest quality of service to its guests from near and far. We then left for Tarangire, one of Tanzania’s most beloved national parks. Before arriving at the main gate, we stopped at Kirurumu Under Canvas, a permanent 10-tent camp in the bush. As in most of Tarangire, elephants are common in this area and residents can often watch them from their tents’ verandas. We also visited Tarangire River Camp, a 21-tent camp that includes four roomy family tents and a beautiful, roomy swimming pool for refreshing dips after a long day of safari. The Tarangire River is dry for about 9 months of the year, but even when there’s no water the river bed is quite stunning. The Tarangire River Camp is on a peak that overlooks the winding river. Guests can look down to watch elephants and other animals come to the river to drink. When the river is dry, animals dig in the bed to bring water that lies just below the ground up to the surface. On to Tarangire National Park! We stopped at the visitor’s center at the main gate, which had many informative signs about the local flora and fauna, some stunning stained glass pieces portraying scenes from the park, and a high platform where visitors can oversee most of the park. Tarangire National Park: Can you spot the elephants? Inside the park we had a delectable Indian buffet for lunch at Tarangire Safari Lodge, a camp with 35 tents and 5 bungalows, many with views of the Tarangire River. Rooms feature beautiful linens from Tribal Textiles, a women’s cooperative in Zambia. Special activities include morning walking safaris and nighttime game drives. 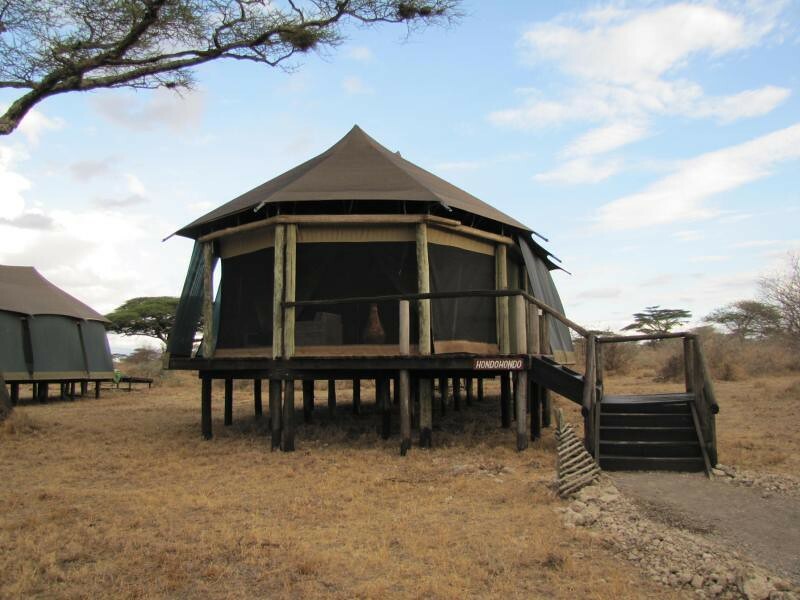 Our next stop was the exclusive Oliver’s Camp, near the park’s Boundary Gate (about 30 kilometers from the main gate). We had a wonderful game drive on our way, stopping to watch a cheetah and two of her cubs shortly after a kill. They were very much enjoying their impala dinner. Toward the center of the park is a large swamp, offering a shocking and welcome swathe of green amidst the arid savannah. The swamp was a popular spot for elephants, reedbucks, open-billed storks, egrets, Egyptian geese; in its vicinity we also saw zebras, Eastern race wildebeest, ostriches (including several babies! ), waterbucks, warthogs and a multitude of other animals. Oliver’s Camp is a 10-tent luxury camp on the eastern edge of the park, south of the swamp. Tents are well-spaced, offering plenty of privacy, and decor is a combination of traditional English safari with a modern flair. Private outdoor showers attached to the tents are a fun way to enjoy nature. The camp has an intimate feel, and visitors can get to know one another and the camp managers over family-style meals or request private meals. 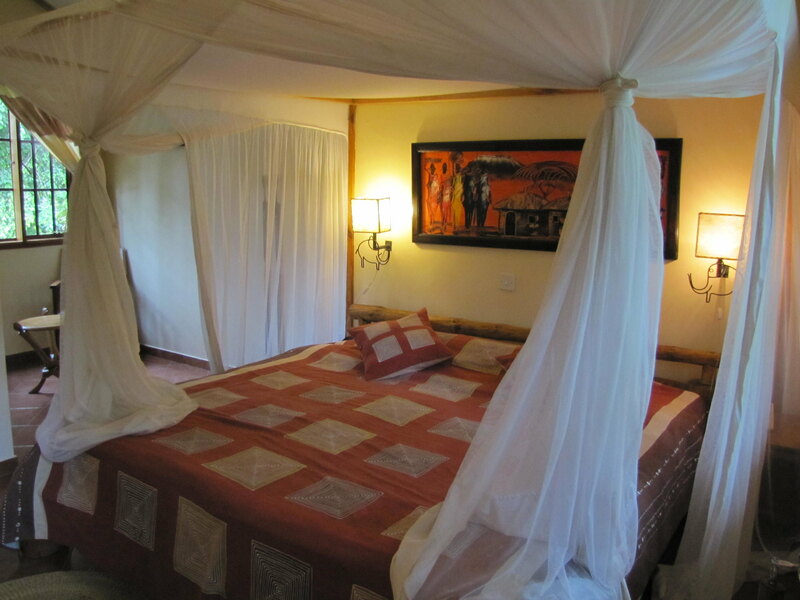 The camp offers walking safaris and night game drives. Each room has its own private safe. We then headed off to Maisha Kikoti Safari Camp for dinner and overnight. The 18-cabin camp is on a reserve just outside the park and is named after Kikoti Rock, a stunning geographical landmark at the top of the hill. Our dinner was a delicious barbecue under the stars. An attractive fire pit at the center of the dining area brought light and warmth to the area. We loved our cabins — spacious, and incorporating natural features such as tree branches and stone into the architecture. Large screen windows and wood-framed screen doors surrounded three sides of the cabin, allowing plenty of fresh air in. We awoke to a morning wake up call of fresh coffee, which we sipped while enjoying the view from our high veranda overlooking the valley and park.